Knives work at their finest when they have a razor sharp edge. You might have invested so much in knives over the years and bringing it back to life should be the top priority. Fortunately, electric knife sharpeners came into existence. Looking for a cheap and high-quality sharpener is always a daunting task. But that doesn’t mean it’s impossible. Some sharpeners do work better than others. Out of numerous brands on the market, the Chef’s Choice 120 Diamond Hone 3-Stage Professional Knife Sharpener is one of the best models in the mid-range category. The reason why we recommend the Chef’s Choice 120 model is that it can perform all the benefits of a sharpening tool in one gadget. Let’s get started with Chef’s Choice 120 review. 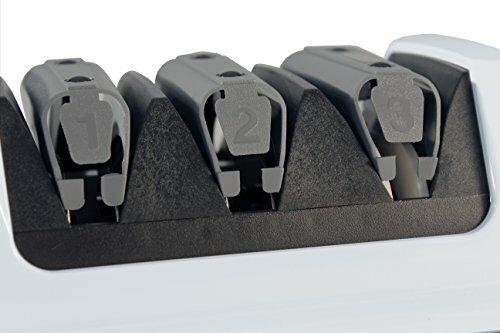 What Makes Chef’s Choice 120 Professional Knife Sharpener Interesting? The Chef’s Choice 120 is a type of countertop appliance that has an outline of 9 1/2” by 4 by 4 inches. However, if you are irritated with a device that comes with several gauges, dials, buttons, and switches, then this knife sharpener is for you. The Chef’s Choice 120 has only the on-off power switch which can be found in front. The 3 stages of sharpening slots will help you restore dull knives in no time. This professional sharpener allows you to sharpen serrated as well as straight knives. 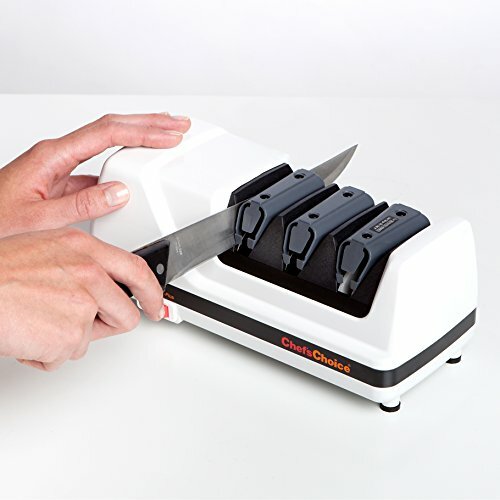 This three-stage knife sharpener makes use of two precision conical honing/sharpening stages that have 100 percent diamond-coated disk to reshape the knife. The stropping/polishing stage is the final stage to clean up the burr and delivers hair-splitting sharpness that you’ll enjoy cutting with it. Either way, each stage has a right and left slot which positions the knife’s blade in the perfect honing angle. No guesswork. Now, let’s have a closer look at the three stages of the Chef’s Choice 120. Stage 1 – this stage is used for extremely damaged or dull knives. However, you will not use this stage regularly if your knives are not very dull. Stage 2 – this stage is commonly used for routine sharpening or re-sharpening. Stage 3 – this stage is use to polish the knives and for serrated knives as well. When it comes to design, the Chef’s Choice 120 Professional Knife Sharpener sports a modern and compact design. In fact, it will perfectly match with your other appliances. Not only that, it is easy on the hands and the eyes. Even so, its simple design makes this machine easy to use. Even though it has no handle, there’s a recognizable spot for you to grip the body. In addition, the rubber stoppers at the bottom of the sharpener will ensure its stability while using it. As with other Chef’s Choice knife sharpeners, the user’s manual comes with it. Make sure you read and understand how to handle this sharpener before using it. A lot of users made this mistake by not reading it and start operating the unit. Remember, the safety rules will ensure your safety while operating the machine. And the tips will help you optimize the sharpening results and not ruining your knives. Some users may take a little practice to get excellent results. But rest assured, you’ll be able to pick up the sharpening skills easily. That’s the aim of the electric knife sharpener as opposed to manual sharpening stones. Using this knife sharpener is a piece of cake, proven by hundreds of users. All you have to do is plug it in and flip the power switch (obviously). After which grab a knife then place it in the correct stage. Then you need to pull the blade towards you evenly and smoothly. However, it should only take about 4 seconds to pull an 8 inches blade through the left slot. As you do, the angle guides will hold the knife’s blade securely, assuring an accurately sharpened knife and reducing the guesswork. To sharpen the other side, pull the knife over the right slot and make sure it is on the same stage. Stage 1 restores dull and damaged knives back to the sharp-razor edge through diamond abrasives. In this stage, you will definitely know that you are sharpening the blades since you can overhear it crashing while it is in the slot. At times, you will be able to see small metal shavings fallout from the slots as you tweak the knife over. Stage two uses finer-grit diamonds to hone it to a sharper edge. Stage three uses the polished micro-flute cutter along the edge to finish off and polish off its results. To sharpen a dull knife, make sure to complete all stages. Once a knife is sharpened, you’ll use the second and third stage more frequently to maintain its sharpness. Serrated knives can only be used in the third stage. The number of pulls one each stage will depend on how dull your knife is. Start with a few pairs of pulls to test the result first before you try around round. Very often, you’ll only need one try to restore its dullness. By the way, you don’t need to use any water or honing oils while you are sharpening. 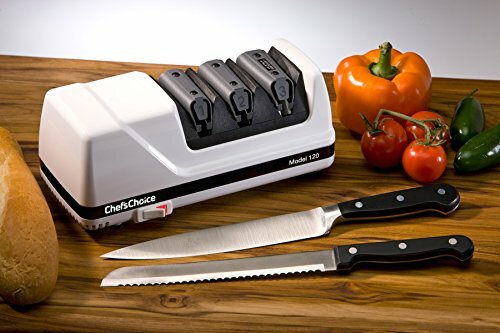 The Chef’s Choice 120 can be described as an easy to use knife sharpener. Depending on individuals, the ease of use can be a bit biased at times. As what we have mentioned a while ago, this unit sports a compact, modern, and simple design. With the 100% diamond abrasives, you’ll only need a few passes to get good results. Diamonds are the best material for sharpeners to quickly restore dull knives. The Chef’s Choice 120 comes with three years warranty, which is a bit longer compared to other brands. As a matter of fact, some makers only offer a one year warranty. So as a customer, for sure you’ll find three years warranty is a good investment on top of its performance. It’s only for conventional American and European style knives with 20-degree angle edge. If you have a Japanese style blade that is 15-degree, this knife sharpener isn’t for you. What we mean is, the Chef’s Choice 120 is not constructed for knives that have thinner edges. Though, you can consider other Chef’s Choice knife sharpeners like the Chef’s Choice 1520 or the Trizor XV. The Chef’s Choice 120 is very easy to use and fast that you do not even have to think about it. Honestly, it impressed many customers how it rapidly turned dull knives into an extremely sharp one. In fact, even the serrated knives were strikingly sharper. As compared to other cheaper models, this knife sharpener is a bit expensive. However, it is still worth considering because it is loaded with impressive features that everybody will surely love. Nevertheless, if you are looking for a knife sharpener, we highly recommend the Chef’s Choice 120. But if you’re a bit hesitant about this product there are still lots of options waiting for you. You may want to check out the 2-stage knife sharpener – Chef’s Choice 320 Diamond Hone Electric Knife Sharpener. We hope this Chef’s Choice 120 review will help you make the best of your buying decision.